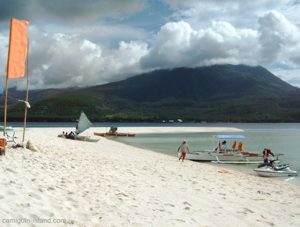 Camiguin Island is located only 10 km north of Mindanao and is well known as a natural paradise. From the north side of the island you can see the Island of Bohol, which is about 50 km away. There are Seven(!) Volcanoes on the island itself from which two are still considered "active". The presence of these volcanoes which rise up to 1800 meters high, supply the island with lots of water which comes out from several hot and cold springs all over the island. Rivers are forming waterfalls, where the water drops down from up to 76 meters in the middle of a tropical rainforest, like the Katibawasan Falls. 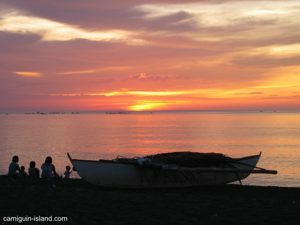 Since Camiguin is an volcanic island, most of its beaches are black. Maybe the only drawback, at least if you like white beaches on an tropical island. But if you like to see white beaches, you might take a short boat trip to White Island or to Mantigue Island and you have white beaches at it's best. Camiguin does not only have natural wonders on the surface. 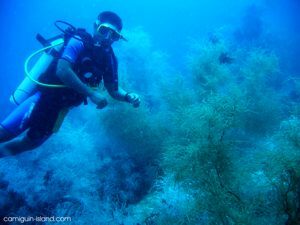 The beauty of the island continues even under water and offers some very spectacular and colorfull dive sites. Turtles, Manta Rays and Reef Sharks can be seen at the right time of the year. Taken all this natural wonders in consideration, you should think that the island would be occupied with tourists but only a very few resorts gather for the very few foreign tourists who come to Camiguin every year. For tourists that means that the local people are not spoiled by tourist money and there is no typical tourist ripp off on the island. The locals are very friendly to foreigners and will always greet you with "Hello Friend" unlike the typical "Hello Joe" which you will hear at every other place in the Philippines. Spending your holiday in Camiguin means quiet and peacefull holidays. Just enjoy the natural beauty of the island and relax. If you feel bored however, just sign up for some Scuba Diving or a trekking tour to the Hibok Hibok Volcano. You may also want to rent a motorbike and discover some of the waterfalls and springs by yourself.